New & Improved White Cloud 2 ply Bath Tissue and High Value Coupon! White Cloud Bath Tissue is proud to announce its new and improved 2-ply Ultra Strong & Soft and 3-ply Ultra Soft & Thick Bath Tissue, and they want you and your family to enjoy it for free by joining the White Cloud “Free 4 All”. 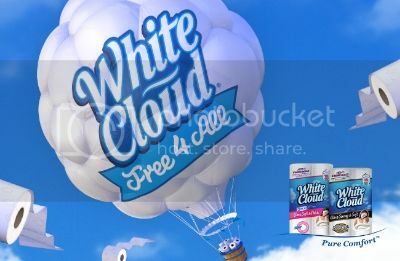 The White Cloud “Free 4 All” gives users a coupon good for a free 4-pack of White Cloud’s premium 3-ply Ultra Soft & Thick Bath Tissue. White Cloud not only wants to give shoppers four free rolls of premium bath tissue, but also wants to let customers in on a shopping secret. White Cloud’s new 2-ply Ultra Strong & Soft and 3-ply Ultra Soft & Thick Bath Tissue comes in a 16 roll pack, yet costs the same as the regular price for 12-roll packs of Quilted Northern and Cottonelle. That means four more rolls of bath tissue for the same price other brands are charging for 12. By using the “Free 4 All” coupon, shoppers can double their number of extra rolls, giving them 8 extra rolls for a total of 20 for the price of 12! White Cloud 3-ply has been named “best for less” by a national consumer magazine, and is known for their family of soft Facial Tissue, and strong Paper Towels. Discover the difference White Cloud’s new and improved premium 3-ply Bath Tissue and stronger and softer 2-ply offer. White Cloud is excited to show savvy shoppers the simple truth: More rolls and an improved product means greater value. White Cloud is a premium brand of bath tissue available only at Walmart. You can get a 16 pack of White Cloud for the same as regular price of 12 pack of the competition, what even more amazing is you can now get 33% more rolls! So head over to Walmart ( here's a Store Locator) and get this fantastic product! Like White Cloud on Facebook so you can grab your opportunity to obtain a free 4-pack of White Cloud’s new and improved premium 3-ply Ultra Soft & Thick Bath Tissue with the purchase of any White Cloud Bath Tissue through a high value Coupon on Facebook($1.97 off) if they share the coupon on the social channel of their choice (Facebook, Twitter, or Pinterest),or a $1 off coupon is available to fans that simply wish to print a coupon. So head over and Follow White Cloud on Twitter and Follow White Cloud on Pinterest for all the latest news, coupons and more! Dare to compare White Cloud 2-Ply and 3-ply Bath Tissue to Cottonelle and Quilted Northern! The White Cloud family of products includes bath tissue, facial tissue, and paper towels only at Walmart! We use this brand every now and then. Nice coupon here and may be trying it again soon. That’s a good coupon. Too bad you have to use face book to get it. Companies need to remember that some of us older people that shop aren’t using f.b. And, we are the ones that buy or don’t based on that. Thank you for sharing this coupon with us. Have a sweet day. That’s a great deal! Thank you!